In honor of cherry blossom season Japanese Ambassador Shinsuke J. Sugiyama takes us inside his stunning residence. 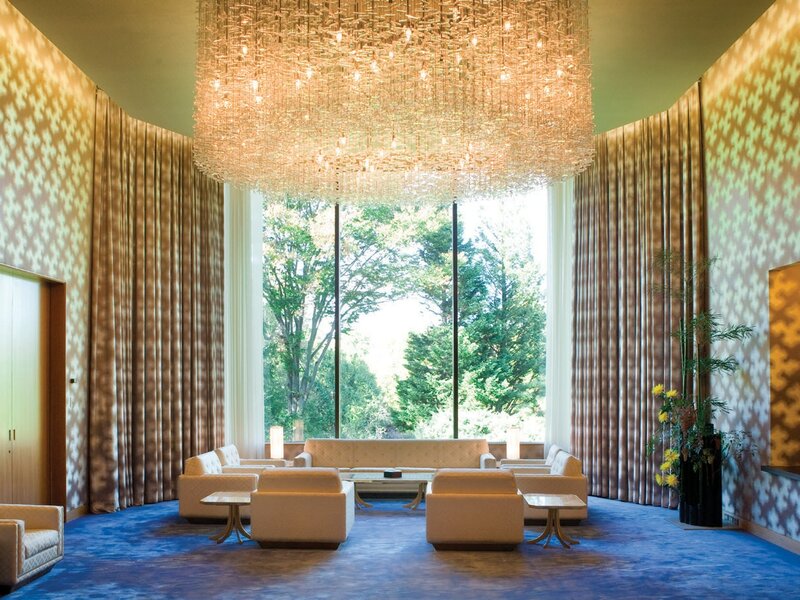 Hidden inconspicuously on eight acres off Nebraska Avenue in American University Park is a Japanese-styled attraction that gets much less attention than the annual Cherry Blossom Festival—the elegant residence of the Japanese ambassador. Its current occupant, Ambassador Shinsuke J. Sugiyama, says, “The house is an amazing architectural artwork and gives guests a strong feeling they’ve been transported to a little piece of Japan.” Here are some of his favorite parts of the residence, which was designed by architect Isoya Yoshida and completed in 1977. One of the most distinctive features of the residence is a teahouse, which is adjoined to the modern main building by a traditional wooden and red-carpeted passageway that borders a placid koi pond. “The first thing guests notice as they enter is the Yu Yu An teahouse, which seems to float quietly on the water. Though the teahouse is always in clear view through the dramatic window that dominates the main hall, the long path leading toward the Yu Yu An means you can find a quiet moment even if hundreds of guests are at an event.” Insider Fact: A different teahouse behind the actual embassy was built in Japan and then reassembled in the U.S. 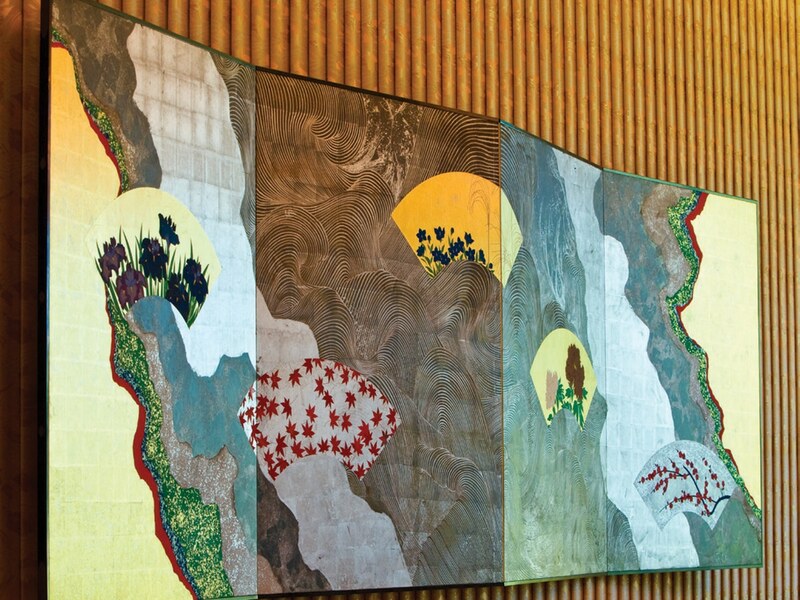 The Kayama Matazo masterpiece “Four Seasons” accentuates the main dining room. 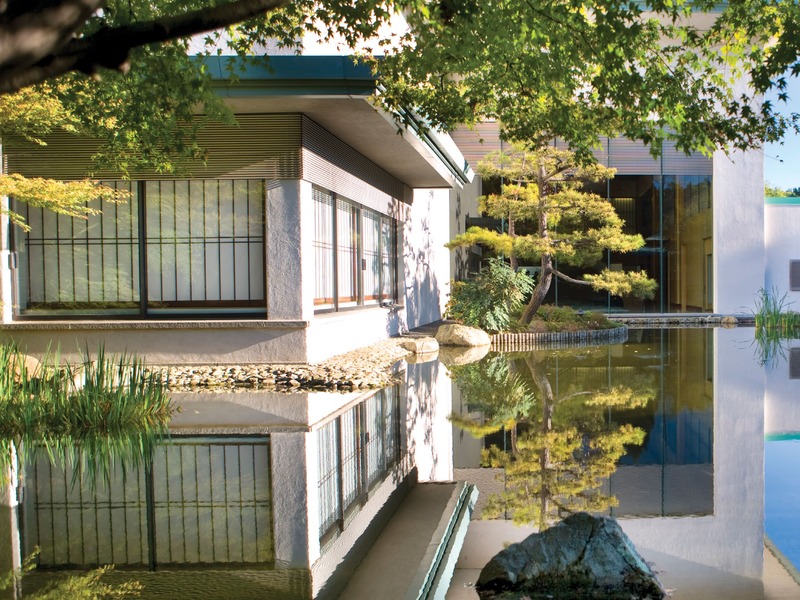 “The collection at the residence creates a sort of museum that introduces guests to some of the styles and techniques used by Japan’s greatest artists, including some who were honored by my country as living national treasures. I feel a deep emotional connection to all of these great artists after spending so much time living and working side by side with their creations.” Insider Fact: Architect Isoya Yoshida mandated that each room have only one piece of art. Toko Shinoda’s “Destination” holds court in a reception area—Shinoda’s art merges traditional calligraphy with modern abstract expressionism. “The residence only truly feels alive when it is filled with conversation, music and the aroma of delicious cuisine. The annual reception celebrating the National Cherry Blossom Festival was the first major event we hosted when I arrived last year, and the presence of the Cherry Blossom Princesses and the representatives of State Societies and leaders from around the country filled the building with joy.” Insider Fact: Ambassador Sugiyama’s daughter will be representing Japan as a Cherry Blossom Princess this year.